I have the opportunity to explore so many activities in Middle School, like advanced Chorus. I even starred in the musical Aladdin. My advisors also encouraged me to play the trombone and try all types of sports. Contact our Admission Office today at 410-531-7347 to hear more about the Middle School. Middle School truly is the transformation from child to young adult. It’s where we mentally and physically grow up, find our identities and determine our values. Paradoxically, it’s where freedom and self-expression blossom, yet with an underlying need to be included and part of a group. 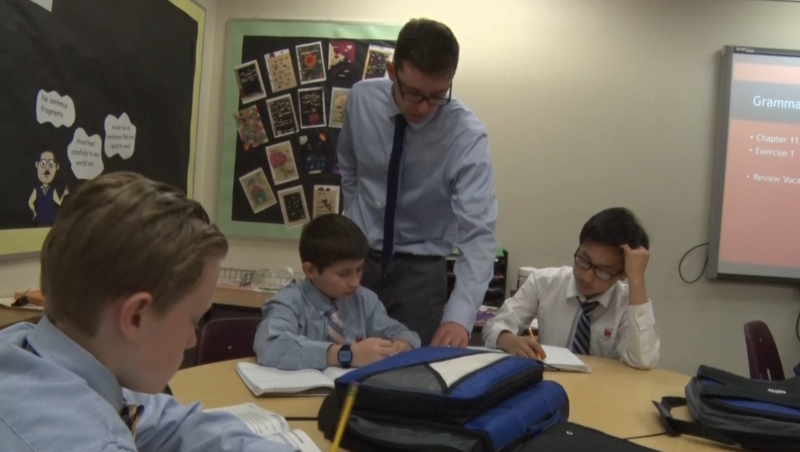 Glenelg Country School’s middle school curriculum provides active learning opportunities that allow students to test their independence while also maintaining a strong sense of belonging to the class. Through our principles of Respect, Responsibility and Judgement, activities and lessons emphasize decision-making, involve critical thinking, and give students the chance to offer solutions to real-world problems. At the same time, our teachers and staff act as strong adult role models to provide guidance when needed. Each student receives one-on-one counseling with a faculty advisor who monitors daily progress, recommends growth strategies and directs the student towards leadership opportunities. In Middle School, extra-curricular activities become more important and are open to all. Through numerous enrichment programs, electives, and athletics, opportunities to explore new interests and discover budding talents are essential at this stage of education. Most of all, Glenelg Country School provides our middle school students with continuity in our teaching methods and individual support. As this is a time for great personal change, it’s our mission to provide direction and a strong academic focus as our students mature into young adults and transition into Upper School.